Made in Hawai'i. An interesting concept, when so much for sale here in Hawai'i is not made here. From Front Street in Lahaina to Poipu on Kaua'i, and Ali'i Drive in Kailua-Kona, much of what tourists are offered is from elsewhere. Tapa from Fiji, fabrics and art from Indonesia, trinkets from Thailand. For residents as well, much of our dollar is spent on imported products, right down to the very food we eat. If the barges stopped arriving for a week or two we would have big problems. Ever since Hawaiians first got involved with cash economies in the sandalwood and polu trades, the same mistakes have been made over and over. Hawaiian farmers left their gardens to work for the fast buck and then, when the resource was depleted and drought set in, there was no food. The challenges of making the shift from sustenance farming and localized trading to operating a bona fide commercial agricultural operation are sometimes insurmountable for the family living on a small farm. Each farming unit has to tie itself to a marketing plan for their product that "adds value" to the base agricultural product. However, the added value can price local products beyond the range of what distributors want to pay. That's why you see more stylized, all-the-same kind of products in the tourist stores. Cheap labor in the Far East allows for the "big store" mentality to dominate. Made-in-Hawai'i products mean a lot to the future of our islands. A self-sustaining core economy is an absolute must if we are to attain a future where we don't have to sell the soul of our islands to maintain some semblance of economic balance. The more effort the state, county, small business, farmers, cultural activists and the community at large put into the Made-in-Hawai'i idea, the better. The more we consciously choose to spend our dollars locally to support local markets, the more independent we become from the market fluctuations forced on us by the larger world economy. There is no one product more Hawaiian and "Made in Hawai'i" than taro. If you look back into the history and legends of Hawai'i and Hawaiians, you find the rootstock of all life is embodied in the taro plant. Betty Fullard Leo tells us in Tapping The Roots of Taro, "the taro or kalo plant originated when the son of Wakea (Sky Father) and his daughter Ho'ohoukalani was born lifeless and deformed, like a gnarled root of a plant. The grieving parents buried the baby, but the next day a taro plant sprouted from the grave, which Wakea named Haloa. When the second son of Wakea was born they named him Haloa also, because he was the younger brother of Taro, from whom all Hawaiians descended." Taro (Colocasia esculenta) is well-known throughout Polynesia, Asia, Indonesia and India as one of the oldest known cultivated crops. "If you understand the growth cycle of the taro you get an insight into Hawaiian society and the how and why of the family system," says Keolalani Hanoa, cultural practitioner and teacher from Punalu'u. "Life begins with the 'ai, the 'aina, that which nurtures us, that which gives us what we eat," explains Hanoa. "Understand that in the Hawaiian language, 'na' adds to the word, makes plural. The corm of the plant, the root or meat, represents the makua or parent and the offshoot or stem is the 'oha.' Thus 'ohana,' the family." In the old days, taro was a mainstay product in all the districts of the Hawaiian Islands. 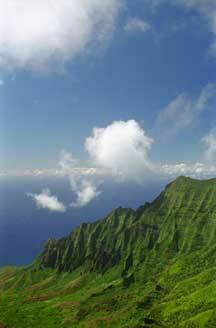 Most of the production came from the lush windward valleys. 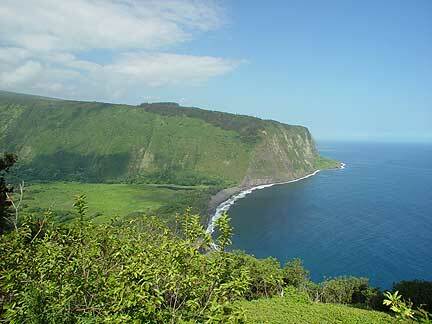 Waipio Valley is still one of the major producers of taro in the state. On the drier leeward side, upland or "dry land" taro farming was predominant. Waiohinu was the center of taro production for Ka'u and the only area on the west side where wet land taro was grown. "The Nau'ukupo'o River that runs from the Ha'o Spring fed the rich lo'i along the hillsides," says Hanoa, whose ancestral lands border the river. 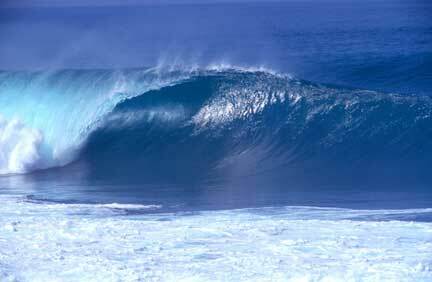 "That's why all the ali'i loved to stay in Waiohinu, which means, 'shining waters.' Both dry land and wet land taro varieties were grown in Ka'u and an abundance of sweet potato as well." Although Hawaiian families living the life of the land have always cultivated taro, the mid '70s brought a resurgence of cultural activities - and taro and poi were at the center of the activity. The late Clarence Medeiros Sr. of Honakua in South Kona established one of the largest poi-making operations on the island on his family land at that time. Clarence learned quickly that vertical integration of his product was necessary to make farming profitable. "We grew taro not knowing that we were going to have a poi factory," says his son, Jim. "We grew taro because my dad lost a job he had with the National Park at Honaunau and so he decided to come back to the land. He brought back the taro lands that he had gotten from my grandpa. But the taro was only getting about $9 for a hundred-pound-plus bag. We didn't see any future in that. And we had nearly 30 acres going by then. My dad and them pound poi for their whole life but you can't pound poi for do commercial venture. We got a little machine they used to make mochi. It would come out of the machine like a little string about one inch thick, just flowing out of the machine. We used it for poi. The first time we started off cooking about two bags of taro about 200 pounds, we grind 'em and we made 200 one-pound bags of poi. We went with my dad and give them away to all the old people all over Kona. We knew already this was the bomb!" More than 60 varieties of dry land taro were eventually cultivated by farmers on Hawai'i Island. "We had many types of varieties that we used," says Medeiros. "Palai'i that had a green leaf with a red stripe, made a light gray poi. We had Makoko, Lehua, Ele'ele that has a black stem, makes a beautiful dark purple poi. Lehua, a nice reddish poi. Ohe, which is white. "We have Elepaio. It had big leaves with white splotches. It was like spotted. It was the only taro in the patches that had spotted leaves. "They all had different colors and different flavors of poi. Incredibly ono." All over the island this story was being replayed as families struggled to create self-sustaining economies. "There were poi factories springing up everywhere," says Medeiros. "People say it was part of a cultural resurgence but I think everyone was already pounding poi but now we were creating poi factories and creating an economy. Had all these guys with taro all business-minded. And was tenacious. Was serious competition at the time for shelf space. Waipio Poi, Higashi Poi, No Ka 'Oi Poi. We were Kona 'Ohana Poi. Sometimes we got Haleiwa Poi from Oahu in the '80s. We were really country people. We didn't know about business. It is so western. All about competition. Cut-throat. All about whatever it takes to make money. No more aloha." And that's always been a problem for locals whose culture is embedded in family and in sharing, and in cooperation, making the transition to western-based economic pursuit a struggle. In the late '80s, poi ventures began to fail. Some falloff was due to the age of the workers and the lack of a younger generation who wanted to continue the legacy. Plant disease was another factor that caused a dramatic drop-off in taro production, leaving wholesalers with even less product in a market with a high demand. According to farmers, most of the disease problem related to the water used in the wet land taro production. The disease is a fungus (Phytophthora colocasiae) that attacks the corm itself, causing rot in the center of the corm. Since most of the production of taro on the Hawaiian islands as a whole is in wet-land taro, production fell off rapidly. Apple snail infestations have also decimated crops in many locales. Most well-kept dry land taro patches do not have any major disease problems, according to the University of Hawai'i College of Tropical Agriculture. As culturally centered as taro is as an agricultural product, even taro is apparently not safe from possible manipulation by GMO engineers at the University of Hawai'i. John Cho, from the University's Department of Plant Pathology writes, "consumer demand for taro products is higher than local production, however increased production to meet present demand is limited by the vulnerability of commercial varieties to the environment and diseases. Our research focuses on the use of modern molecular techniques to accelerate breeding for varieties with increased disease resistance to taro leaf blight caused by Phytophthora colocasiae and other desirable attributes." But others in the industry say the decline in production was due to the generational ebb and flow that has historically occurred in taro production. One generation picks up the mantle and the next walks away from the farm. As that generation matures, many see the value of making a new effort. "We just grew up and left home and my parents got older and it became difficult," says Medeiros. "So eventually we went out of business. Now I look back and I see that my family's future is still based on the 'aina." Today there is a great market for poi and Medeiros plans to start again in the poi business. "Getting licensed for a commercial kitchen again is the biggest cost right now. Our labor is our labor so getting the patches back together can be done." A new age of growth for the taro market is upon us once again. Many practitioners have moved into the educational aspect of their taro patches, coupling their labors with educating schoolchildren in the arts of agriculture while teaching Hawaiian culture through the taro; adding value to their product in an entirely novel way. Charlie and Paul Reppun are stalwarts of the taro renaissance in Hawai'i. Their work restoring the traditional taro lo'i of Waiahole as well as their participation in the Waiahole Ditch water case establishing the rights of traditional farmers to a continuous clean and healthy water supply is at the forefront of the taro movement. Ed Wendt of East Maui is another pioneer in the taro restoration movement who went to court to help re-establish the water rights of the traditional farmers in the East Maui Mountains. "The demise of taro production began with the diversion of water from streams by the sugar companies in the late 1800s," says Moses Haia, attorney for the Native Hawaiian Legal Corp. NHLC played a major role in litigating the return water rights to taro farmers in East Maui. "After these initial diversions, Hawaiians were forced to move from these areas. Not until recently have we been able to reclaim some of these lands and only through long, protracted legal battles. The availability of land and water are still the biggest obstacles to the resurgence of taro farming in Hawaii. In East Maui, there are hundreds of acres that could be restored to production. Right now only about 20 acres is in production. With the return of the water to these streams, you'll see production boom. These guys like Ed (Wendt) and the Reppun brothers that are reclaiming traditional lo'i are some of the biggest heroes of the Hawaiian movement." The need for new and novel products made from taro is seen as a key to expanding the market beyond traditional boundaries. Farmers and wholesalers have answered with the creation of all kinds of creative products made from taro, taking the marketing of taro products to new levels. The Poi Company in Honolulu specializes in a wide array of poi products and markets them as health foods. Taro and poi are an excellent source of fiber and vitamins C and B-1 as well as potassium, magnesium and iron. They have half the calories of rice and have been recommended as a healthy staple in popular diets such as Terry Shintani's Hawai'i diet and the well-known Waianae Diet. The Poi Company also sells poi flavored with kiwi, banana, coconut, eggnog or cinnamon, poi English muffins, cheesecakes and bagels. Taro works well in combination with baked goods because it is high in a substance called soluble gum, according to research by Alvin Huang of the University of Hawai'i. "Added to bread it gives a unique 'mouthfeel,' thick and rich, even though there's no fat in it," he says. This means something soft and flavorful can be baked with taro using less butter, oil and dairy products than with traditional flours. This property of taro is unique among starches, he says. Potatoes don't have it. Oatmeal is close, but because of its high fiber content it produces a grainier baked good. Eric Enomoto, of HPC Foods, Hawaii's other large processor, doesn't agree that the industry is without recruits. "We have a great group of farmers that we have worked with for over 30 years," he says. "We have seasonal shortages, for sure. Our peak demand time is in the spring and summer and these are the same times that farmers have less production. But it all tends to work out. We do not find it necessary to import any raw taro and prefer to work with Hawaiian varieties exclusively." HPC wholesales taro products throughout the islands and retails through its bakery in Honolulu. It specializes in products made from the taro flour they produce. "Hawai'i has very unique varieties of taro and we are working with our growers to identify the very best for use in our products," says Enomoto. "We don't feel that, generally, dry land taro is of the quality of that of wet land. 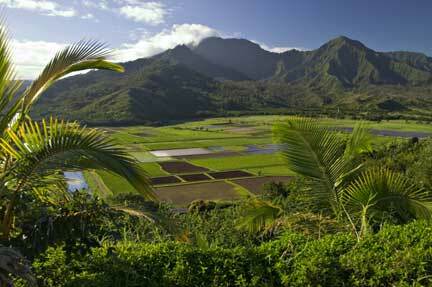 The bulk of the taro we buy is wet land and produced in Waipio Valley on Hawai'i Island. Our goal is to continue to produce top-quality products and to increase our export market of these products worldwide. We've been at it for a long time but it's still a work in progress." The Hawai'i Taro Growers Hui, a member-owned for-profit cooperative on the Big Island, received a USDA grant for research in value-added product development in taro, and has experimented with quick-frozen and vacuum-sealed taro, as well as incorporating taro into sausages. "For the most part, these products worked well," says hui director Donn Kansako of Honomu, "but when you try to move from a development to a productive scale, it's just too cost prohibitive. So the cost factors are what we're focusing on now." Among other ventures, the hui sells taro to the Hawai'i Taro Company on Maui for use in taro burgers, which have just begun to be distributed on the mainland by Whole Foods. "Our goal is to vertically integrate our taro process, so that the farmers become involved in the whole thing - all the way through to the product stage," says Kansako. "That's the way they'll be able to make sufficient income." Taro, a versatile cooking ingredient, is also finding a home as an integral part of the new wave of Hawai'i Regional Cuisine as offered by the chefs of fine restaurants and upscale resorts around the island. Taro production reached 6.8 million pounds in 2000, according to Department of Agriculture statistics. Taro farm revenues soared to a record $3.6 million, up 13 percent over the previous year. Statewide, 420 acres are planted in poi taro, the most since 1979. But cultural activists claim that many growers are just small farmers, growing for sustenance or trading within their communities. These producers' product doesn't show up in the statistics and so it's truly difficult to ascertain how much taro is being grown overall. Jerry Konanui of Pahoa, who serves as president of Hui Kalo Moku O Keawe, says the practice of growing taro is definitely on the upswing here. The Hui Kalo, which was founded in 1993 for the purpose of preserving and perpetuating traditional taro growing and providing educational and networking opportunities for farmers, provides free huli (propagation material) on Tuesdays and Thursdays at the UH Panaewa Farm site. They are finding their offerings to be in increasing demand. "What we stress is for home growers to have taro in their backyards, even in five-gallon buckets on their lanai," says Konanui. If a person plants for their own use, they will often have enough to share with others as well. This maintains the culture of taro within the 'ohana, and on the palate as well, and this in turn helps the commercial growers, because once people start incorporating a lot of taro into their diet - developing a real taste for it - they'll start purchasing the commercial products to add to their home-grown." Konanui says he believes that there are more taro growers and processors that ever before. "And that's a good thing. When I see all those bags of poi in the stores, I feel really good." Protect Keopuka Ohana is a coalition of Hawaiian cultural practitioners, farmers, and environmental activists whose mission is to protect the pristine a�ina of Hawaii, to malama our ancestors, achieve repatriation of our sacred sites, lands and artifacts and promote the living Hawaiian culture. "Our purpose is to promote quality of life activities for our island communities, advocating for long term social and economic benefits for our people. We are committed to preserving the environmental integrity and cultural legacy of these ancient lands for the future generations."